Normal articular countours, slight joint space widening caused by effusion/synovitis/ligamentous laxity. Joint space narrowing with debris and osteophytes less than 2 mm in size. 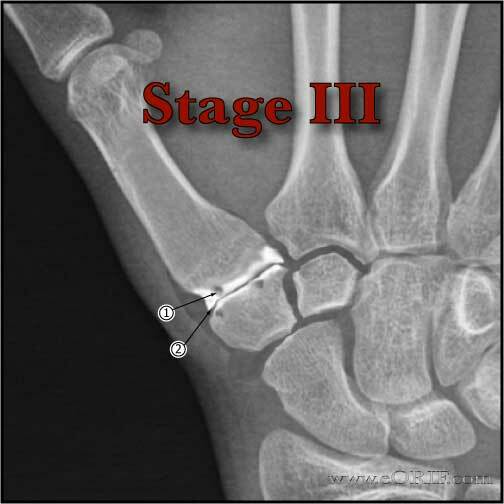 Treatment = LRTI, or trapeziometacarpal fusion or implant arthroplasty. Mild joint narrowing, osteophytes less than 2mm in size, minimal sclerosis/cystic changes. Marked joint space narrowing, sclerosis and cystic changes in the trapeziometacarpal joint. Scaphotrapezoidal joint space involvement in addition to narrowing of the trapeziometacarpal joint. Treatment = LRTIwith complete trapezium excision. 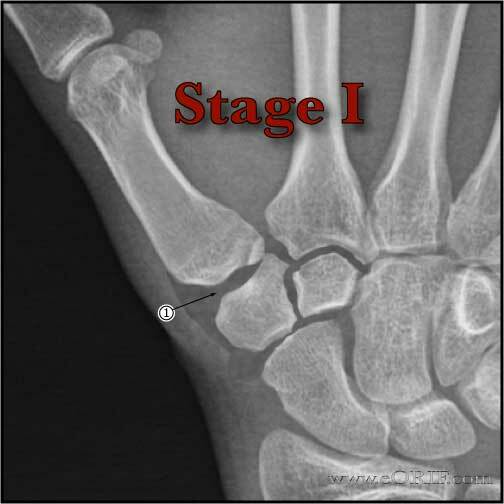 Joint space narrowing, sclerosis and cystic changes in the scaphotrapezoidal joint.